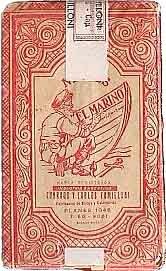 In 1816 imported, foreign playing cards were taxed at 30 reales per dozen packs. As a precaution, locally produced packs were stamped on the two of swords, and imported ones on the two of coins. On June 27, 1842 tax was imposed on playing cards by General Antonio López de Santa Anna. The treasury would control the manufacture and sale of playing cards through the tobacconists. Auditable accounts were required. In 1892 the Internal Duties law was passed (no.2856) introducing the use of a tax stamp to be affixed around each gross of playing cards. The example shown (left) refers to a law of 2nd August 1895. In 1899 these were replaced by bands, initially for a dozen packs and then for single packs. There were several laws and decrees enacted which varied the details of the tax bands and stamps over the years. The 'Boletín Oficial' dated 26th January 1899 (Official Government Bulletin) states that the inland revenue tax bands on playing cards shall be black for home-produced packs, and red for imported packs. It appears that the colour of these tax bands varied in the course of time, as well as the colour of the tax stamps themselves (below). 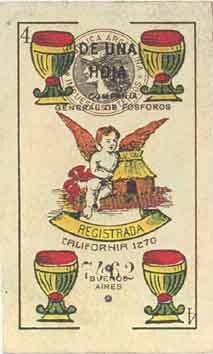 Furthermore, the bulletin also states that the manufacturer must print his name and address on each outer wrapper, and also submit the four of cups (in Spanish-suited packs) or the ace of hearts (in Anglo-American style decks) for a control stamp to be applied, and that this card, once stamped, must be left outside the wrapper for inspection. Similar regulations governed the supplies of cardboard which also were officially controlled. Offenders were fined. Left: blue tax band (one peso) on outer wrapper of a standard 'Side-Car' pack made by Luis A. Fourvel & Cia., Buenos Aires, c.1945. The manufacturer was also required to print his name and address on the tax band, as shown here. The tax band refers to "Decreto No. 18,235" which was used between 1944-64. Above: a 50 centavos green tax band from a pack imported from Spain c.1930, referring to "Ley de Impuestos Internos No. 11,252" which was used between 1924-43. The box at the right-hand end contains the name of the importing agent: Casa Bertrand Domec de F. Fernández y J. Fagoaga. Above: a rare 50 centavos blue tax band from a pack manufactured in Buenos Aires for Apeles S.A., referring to "Decreto No. 18,235" which was used between 1944-64. The box at the right-hand end contains a stamp which reads: C. A. 14 which must have been the code for the manufacturer. Above: tax band from a pack manufactured in Buenos Aires by Igor L. M. Domicelj, referring to "Decreto No. 18,235" which was used between 1944-64. 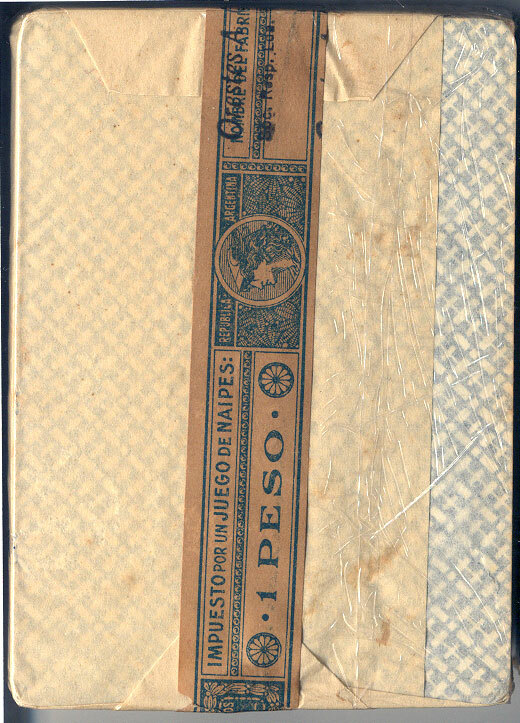 Above: 1 Peso blue tax band, normally used on imported decks, but occasionally used on home-manufactured ones, as in this case from a pack manufactured in Buenos Aires by Orestes A. Cappellano, c.1944. Referring to "Decreto No. 18,235" which was used between 1944-64. 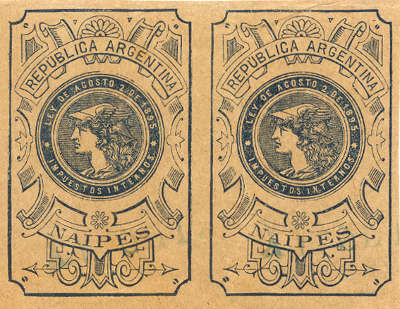 Above: tax band from a pack manufactured in Buenos Aires by Cappellano S.A. c.1960, referring to "Decreto No. 18,235" which was used between 1944-64. 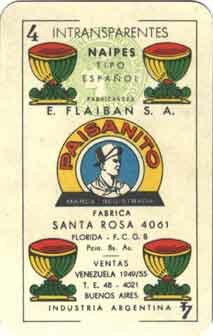 Above: tax band from a pack manufactured in Buenos Aires by Paisanito S.R.L. c.1953, referring to "Decreto No. 18,235" which was used between 1944-64. The amount of tax can be 50 centavos or 1 peso. Above: tax band from pack manufactured by Justo Rodero e Hijos S.R.L. in around 1950, also referring to "Decreto No. 18,235" which was used between 1944-64, although the image of Mercury has been changed to Marianne. Above: 2 peso yellow tax band from an imported pack, referring to "Decreto 18,235" used between 1944-64. Above: tax band from an imported pack, referring to "Ley No. 16,656/64" used between 1965-7. The amount of tax can be 5 or 10 pesos. 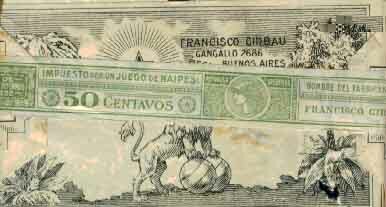 Above: tax band from a pack manufactured in Buenos Aires by Carlos della Penna, referring to "Ley No. 16,656/64" (1965-7). The amount of tax can be 5 or 10 pesos. 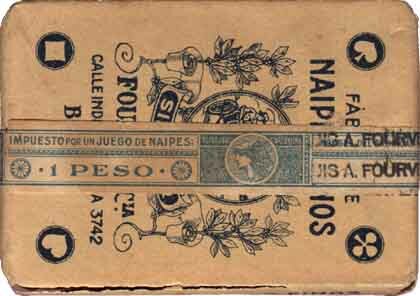 Above: tax band from a children's card game manufactured in Buenos Aires by Juegos Victoria, referring to "Ley No. 17,196" (used between 1965-7). The amount of tax can be 10, 20 or 40 pesos. Above: the tax stamp was printed onto the four of cups for Spanish-suited packs, or the ace of hearts for Anglo-american decks. The earliest examples appear after 1892, in black. A pale brown version was used on imported cards. There are at least three versions of the "Mercury" stamp, with slight differences in the engraving or lettering. The last type ("Marianne") appeared in 1953. Tax on playing cards was abolished in 1968. 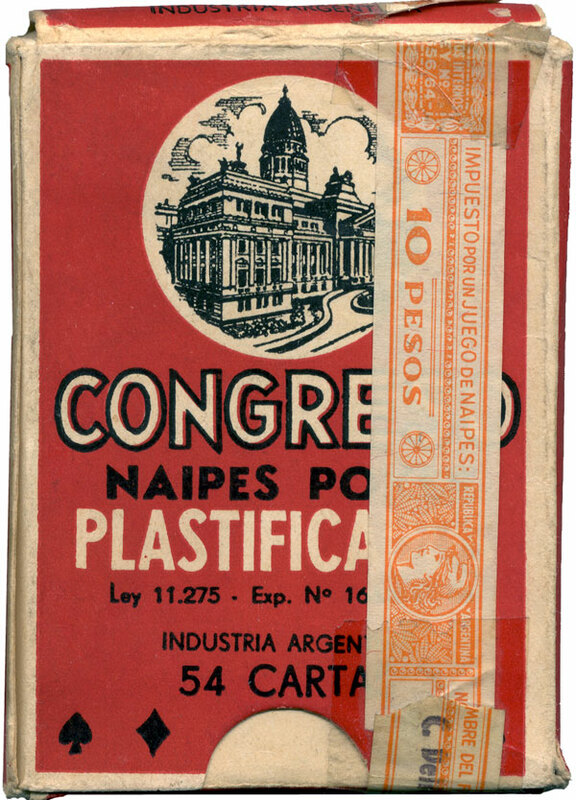 Left: black tax stamp on a pack made by Compañia General de Fosforos, Buenos Aires in c.1915. (Image courtesy Enrique García Martín). 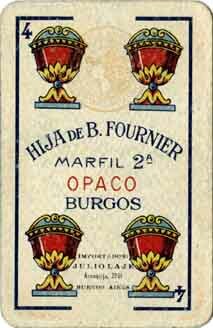 Left: pale brown 'import' tax stamp on a pack made by Hija de B. Fournier, Burgos (Spain) in c.1930 for export to Argentina. The name of the Argentinean importer, Julio Laje, Buenos Aires can be read at the bottom of the card. (The five of swords has the normal Spanish 'Exportación' tax stamp on it). 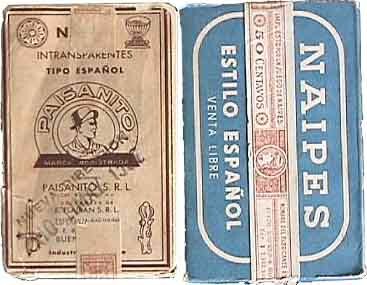 Right: green 'home production' tax stamp on a 'Paisanito' Spanish-suited pack manufactured by E. Flaiban, Buenos Aires, c.1955.